Most internet entrepreneurs who find success with their businesses (which start off as “side businesses”) tend to have an end goal in mind: to quit their “9 to 5” job and work on their own business full-time. But that isn’t always the case. 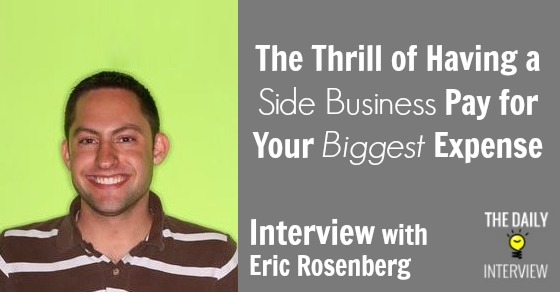 Eric Rosenberg, blogger at Narrow Bridge Finance, has seen some nice success with his side businesses. They’re not quite at the point where they replace his full-time job income, but they are growing and in all likelihood, the income will eventually be at a point where he could quit his day job. But that isn’t in the plans, and he’ll explain why in this interview. 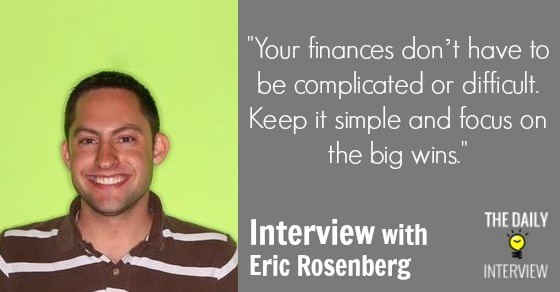 Also in this interview, we discuss what exactly his various side businesses are (one of them will probably surprise you), and how he manages to compete in the highly competitive niche of personal finance. Eric, I’ve really enjoyed exploring your content at Narrow Bridge Finance and learning about various personal finance topics including debt management, retirement, and building wealth in general. I like that you’re not just about socking away money, but instead, spending responsibly. Tell us a bit about your background and journey. What led to the creation of Narrow Bridge Finance? Do you still work in corporate finance? My finance journey began at a young age, but the steps that led to Narrow Bridge Finance really started in college when I became a finance major and when I took my first job out of school working as a bank manager. When I left the bank, I had time working as the guy who decides if you get a mortgage, the guy who dealt with customer service problems, and the guy in charge of all new accounts, teller, and customer service operations for the branch. I decided to share what I learned with my new site, Narrow Bridge Finance. I do still work in corporate finance. After leaving the bank, I spent about six years working in telecom and now work at a company that owns and manages retirement homes. The core of my online income is from my blog, Narrow Bridge Finance, but I have leveraged my reputation and expertise there to earn freelance income from other sources, and that usually beats out what my blog makes. I do freelance writing for a few regular clients and also do web design projects through my parent company, Narrow Bridge Media. In addition, I also own a flash mob company, Denver Flash Mob, that plans and hosts flash mob events around Colorado. The income there is very seasonal, but I like the extra cash I bring in each summer. Do you ever plan to leave your regular job to work full-time on your own businesses? If yes, what’s your current game plan? If not, why not? I don’t have any plans to leave my full-time job, though I had considered the idea of going into my online businesses full-time at one point. I work in finance at enjoy what I do. I like the comradarie and impact I can make working in my job, and enjoy the day-to-day challenges. More importantly, however, I enjoy the stability. I always know where my next paycheck is coming from and exactly how much it will be. I know that my insurance is taken care of, my retirement savings are automated and matched, and how I am going to pay for my mortgage. I guess that’s part of why I went into finance in the first place, I enjoy the stability and predictability of it. My biggest success actually snuck up on me without my totally noticing. I remember how excited I was in grad school when I first realized that my blog made enough each month to cover my bar tabs (which were not always so modest). Then I realized I made enough that I could move somewhere like Thailand and live off of my online income full time. That was cool, but I don’t really want to live in Thailand and budget for less than $20 per day in living expenses. The big moment was when I first was able to cover my mortgage payment 100% for a month with online income, and that income number kept growing. I love being able to pay for my biggest expense with my “side income,” which is becoming more and more a part of my regular income each month. In general, I know that the personal finance niche is highly competitive. What have been the primary ways you’ve been able to stand out and grow your blog’s traffic? That’s very true, there are hundreds of personal finance bloggers I know personally, and probably thousands more that I don’t. I think one of the biggest ways I’ve stood out is by being like a Grandpa in the niche. My site is about six years old with hundreds of posts of quality content. As my blogging buddy once told me, 6 human years is like 97 in blog years. I always hold myself to a high standard and try to only hit the publish button on new content that is really useful for people. I try to write for people in their 20s and 30s that have a good job and just don’t know what to do with their money, which is a fairly uncommon niche among the many frugality, budgeting, and debt focused finance blogs. I see that you offer “money coaching” as a service – helping people make decisions about their finances and keep it all in order. What would you say is the most common issue you’ve come across (with other people’s personal finance situations), and what solution did you recommend? The most common problem I’ve seen is people just not having any plan for paying off debt or saving or having taken any steps to do anything to improve their finances. If you are in a bad spot, the most important thing you can do is make a plan. In my book eBook The Personal Finance Arsenal (also available for Kindle and in print on Amazon), I share a list of free tools that I use every day to keep my finances in order. By making things simple and putting them on auto-pilot, you can be debt free or build up a nice savings account in no time. If you had to take your best advice (about personal finance) or inspirational thought and put it into one sentence or phrase, what would that be? My favorite tools that I use regularly are Mint.com for tracking transactions and budgets, Personal Capital for tracking my investments, and Manilla for keeping all of my statements in one place. I use each of those all the time! Those are all tools that are completely free and help track information from lots of different places in simple online interface. You can always find me writing at Narrow Bridge Finance, but you can also follow me on Twitter (@DenverEric). You can follow me or Narrow Bridge Finance on Facebook, or, the easiest option, just join the Narrow Bridge Finance email list for free finance tips to your inbox. Thanks so much for your time today, Eric, and telling us more about your business. What did you think about this interview with Eric? Do you have plans to keep working at regular job even though your side business is having success? Leave a comment below!